"Wanker" has a frisk and frolic to it. It tastes like good chocolate in my mind. However derisive and self/masturbating-serving, still, perhaps being remembered as a "wanker" is too good to pass up. 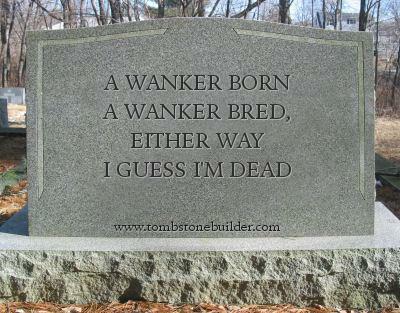 Some funny ones here: https://www.boredpanda.com/funny-tombstones-epitaphs/ I have to say that after seeing a few of these I have reconsidered my last wish of being cremated.